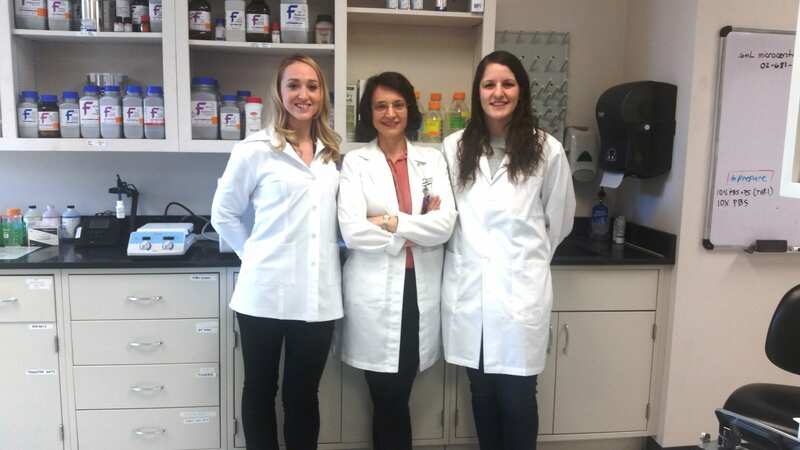 Joining Suzanne Bohlson’s investigation of lupus are Iowa State University student Cally Mills, left, and DMU biomedical sciences student Emily Willmann. For the next three years, Suzanne Bohlson, Ph.D., associate professor of microbiology and immunology at DMU, will expand on her current research focused on a common disease that affects as many as 1.4 million Americans: lupus. This autoimmune disease results from the immune system attacking its own tissues anywhere from the heart to the kidney to the skin. There is currently no cure for it. While the etiology of lupus is unknown, Bohlson is focusing her efforts on a molecule called C1q, which normally circulates in blood. People who don’t make C1q develop lupus in nearly 100 percent of cases. Her research is aimed at uncovering mechanisms that C1q utilizes to regulate the immune response. With $453,000 granted by the National Institutes of Health (NIH), she seeks to further characterize the role of C1q and to identify specific targets for the treatment of lupus as well as a number of other autoimmune and inflammatory diseases. With 27 institutes and centers, the NIH is the largest source of medical research funding in the world. Bohlson came to DMUy in 2013. In addition to serving as associate professor, she is the director of the master of science in biomedical sciences (M.S.B.S.) program and has mentored numerous students through the University’s Mentored Student Research Program. She has engaged two of these students in her current lupus project: Cally Mills, an undergraduate at Iowa State University, and Emily Willmann, a DMU M.S.B.S. student.